Whether you’re planning to visit Indiana for its beautiful scenery, kid-friendly activities, or great sports this state has something for everyone. Rent a car to explore all that the state has to offer, or choose from one of the many Indiana vacation rentals near your favorite attractions for a fun Midwestern getaway. Northern Indiana is home to many lakes and is part of the Great Lakes Megalopolis. Much of Northern Indiana is in the Corn Belt, meaning that corn is the most important crop, and this region has the third-largest Amish population in the country. 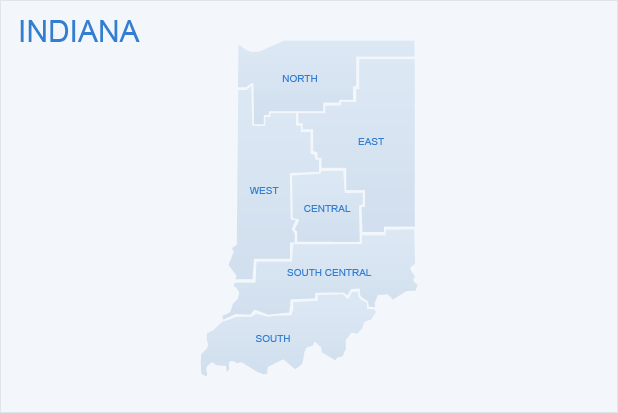 Central Indiana is where the state capital of Indianapolis is located, as well as several major universities like Ball State, Purdue, Butler, and Indiana State. Central Indiana is features many green hills and sandstone ravines. Southern Indiana is a mix of forest, hills, and farmland. It contains the 200,000 Hoosier National Forest nature preserve. The climate in Indiana is typical of the Midwest, with cold winters and mild summers. The average winter temperature is between 35 and 40 degrees (F), but it can be bitterly cold on occasion, especially in the northern part of the state. During the summer, temperatures typically clock in around the mid-80s, with the air being uncomfortably humid. When planning a visit, keep in mind that Indiana is part of Tornado Alley, and tornado season affects the area between April and June. Visit during autumn for the most comfortable temperatures and pleasant weather. 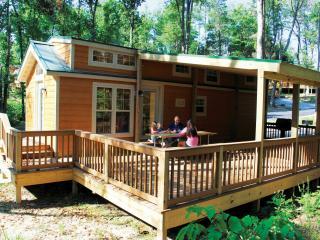 Indiana is home to many gorgeous parks and fun attractions for visitors to enjoy. 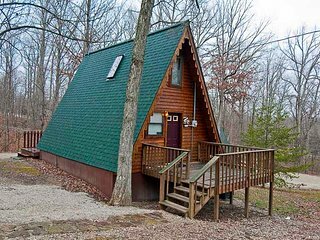 Curious travelers can explore the best the heartland has to offer or stay local near one of the many Indiana vacation rentals. In Indianapolis, the state’s capital, visit White River State Park. It is the country’s only “cultural urban” state park and includes the beautiful Military Park and White River, as well as attractions like the White River Gardens, Indiana State Museum, and Victory Field. The city is also home to The Children’s Museum of Indianapolis. It is the biggest children’s museum in the world and includes a planetarium, biotech lab, carousel, fossils, theater, and much more. The northernmost part of the state is where you’ll find the Indiana Dunes National Lakeshore, which features 15,000 acres of hiking trails, rivers, wetlands, and forests. It sits along Lake Michigan and is managed by the National Park Service. Sports enthusiasts will want to catch a football game at Notre Dame or simply explore the beautiful South Bend campus. Indiana is right in the middle of the heartland, also known as “America’s bread basket.” Classic Midwestern cuisine includes staples such as baked pasta, meatloaf, and pot roast – it’s a great place for hearty, comfort food. Popular state foods are the pork tenderloin sandwich, which consists of a pounded, breaded and fried boneless pork loin on a bun, sweet sugar cream pie and persimmon pudding. The Indianapolis 500 (May): This annual automobile race is one of the top three motor-sports races in the world. The race is touted as “The Greatest Spectacle in Racing” and draws approximately 300,000 attendees each year. Eiteljorg Museum’s Indian Market and Festival (June): More than 150 artists from 60 tribes gather each year to celebrate Native culture in the Midwest. This event includes authentic Native art, food, music and performances. The Amish Acres Arts & Crafts Festival (August): For more than 50 years, this celebration of everything Amish has been a highlight. It’s one of the top 100 arts and crafts events in America and features more than 300 artists selling hand-crafted wares. This state has everything that makes a great vacation: world-renowned attractions, delicious foods and comfortable Indiana vacation rentals to stay in during your trip. No matter which region you visit, this Midwestern state will capture your heart.